The Winking Owl is located in Aviemore, Scotland, and is managed by The Cairngorm Brewery which has been making award-winning beers in Aviemore since 2001! The Winking Owl offers a menu featuring mouthwatering dishes, from main meals to smaller snacks and nibbles to share. Their menu also caters for gluten-free and dairy-free diets, along with their outstanding children’s menu. 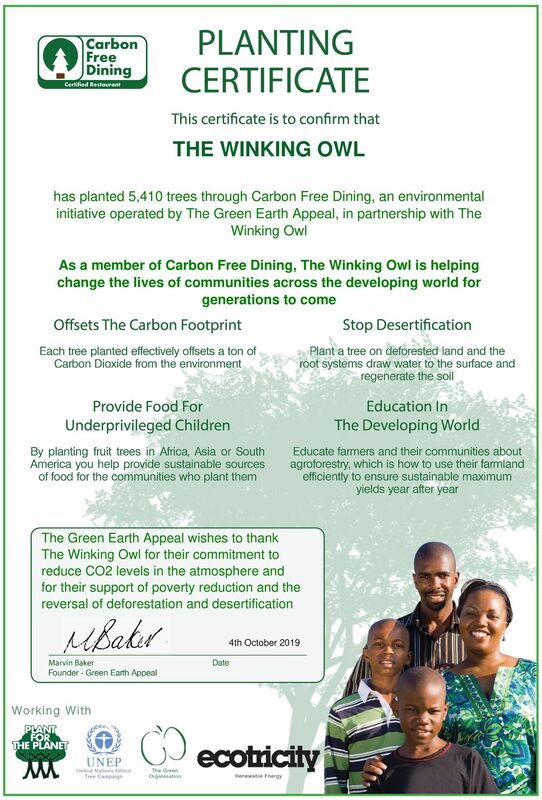 The Winking Owl has teamed up with Carbon Free Dining, the United Nations-backed Restaurant initiative. They have chosen to demonstrate their love for the environment by partnering with the programme. As a Carbon Free Dining Certified restaurant, The Winking Owl plants hundreds of trees each month, effectively offsetting the Carbon Footprint of the meals it serves. This is done by simply giving diners the opportunity of planting a single fruit tree with each bill for an optional 99p.